What Is Turmeric and How Is It Used? The yellow color in many Indian, Thai, and Asian dishes and spice blends is often due to the turmeric spice. It is also known as Indian saffron since the spice is native to India and imparts the same color as saffron. Both fresh turmeric root and dried, ground turmeric powder are used in cooking. In addition to being used across Asia, it is also found in Middle Eastern cooking. Turmeric roots and powder are available year-round. Turmeric is a spice that comes from the root of the turmeric plant. This flowering plant is part of the ginger family and is native to Southeast Asia and the Indian subcontinent. The roots of the plant are what is used in cooking. The fresh root is oblong and knotty, similar to ginger root. Dried, ground turmeric is a yellow powder that can vary widely from deep yellow-orange to bright yellow, depending on the variety. Turmeric is a typical ingredient in curries and a component of curry powder. It is suitable for gluten-free, vegan, vegetarian, and paleo diets. Dried, ground turmeric is the most familiar form of the spice. It has long been a cornerstone of Indian curries and is often included as one of the spices in the garam masala spice mixture. Fresh turmeric root is becoming more and more available in Western supermarkets as it is enjoying a rise in popularity. It can be grated just like its cousin, ginger root, and used as a substitute for the dried powder. The fresh version has a little sweetness to it and produces some juice. Turmeric has an earthy aroma and pungent, slightly bitter flavor that has a hint of mustard or horseradish. It's not a particularly distinct or pleasant taste. Cooks say that it brings out the overall flavors of the dishes it is added to, as well as giving them a yellow color. A touch of bitterness adds a dimension to dishes. This may be why it is often included in spice blends (like curry powder) or only used in combination with other spices. Turmeric actually gets stronger when cooked, so it can be added earlier in the cooking process in a recipe for a stew or braised dish. To use fresh turmeric, you will need to peel the root as the skin is too tough to eat. This is easy to do with a vegetable peeler, knife, or spoon. Then you can grate it, slice it, or dice it. If you are using turmeric for its purported health benefits, its best to include it in dishes with black pepper and fat. This will help your body absorb the active ingredient in turmeric, cucurmin, more efficiently. 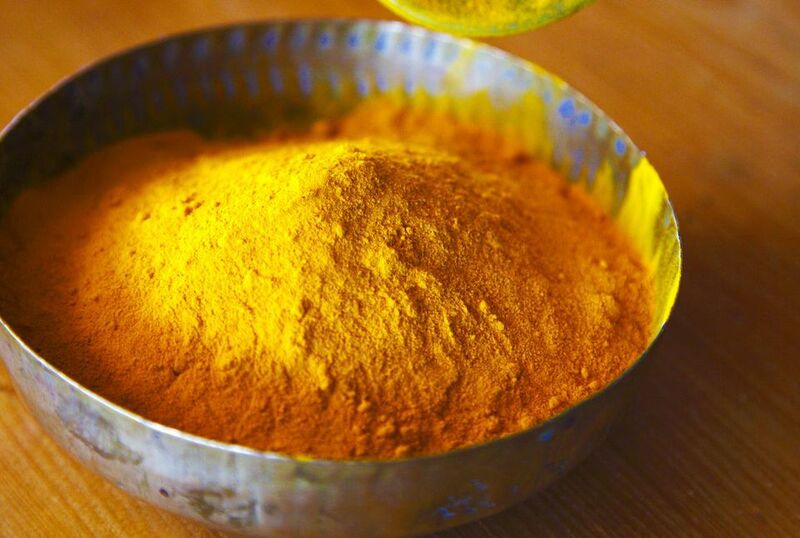 With both fresh and ground turmeric, always be aware that it is a powerful yellow dye. It will stain your fingers, clothing, and countertop. Wear glove and an apron and cover any surfaces. Turmeric is an important ingredient in curry mixes, chutney, and mustard pickles. It also goes well with chicken, duck, turkey, vegetables, rice, and salad dressing. One use that is growing in popularity is to have turmeric in a milk latte or tea. If you don't have turmeric, you can often simply leave it out of a recipe unless you want the golden color. For color and flavor, you can substitute 1 teaspoon dry mustard for 1 teaspoon of turmeric. Although a pinch of turmeric may be used as a substitute for saffron to achieve that golden yellow color, the flavor does not compare in the least. 1 inch of fresh turmeric will produce 1 tablespoons of grated fresh turmeric. 1 teaspoon of ground turmeric is the equivalent of 1 tablespoon of fresh grated turmeric. Dried ground turmeric is readily available in small bottles or tins in the spice section of most grocery stores. You may find it cheaper and fresher at Indian or Asian grocery stores. Fresh turmeric root might be found in the produce or fresh herb section of a well-stocked grocery store, but is more likely to be found at a gourmet or health foods market or an Asian or Indian market. Look for turmeric roots that are firm and not shriveled or soft. Store ground turmeric in a sealed container in a cool, dark place. Turmeric will begin to lose its potency after about six months, even sooner if exposed to light and/or heat. You can store fresh turmeric in the refrigerator in an airtight container for up to two weeks. Or, as with ginger root, you can freeze it and use it for several months. Note that there are no strong studies that support claims that the curcuminoids in turmeric reduce inflammation. There are more studies being conducted to see if it is helpful in a variety of conditions, including cancer, colitis, diabetes, Alzheimer's disease, and rheumatoid arthritis. In Ayuvedic medicine practiced in South Asia, turmeric has long been used for breathing problems, pain, fatigue, and rheumatism. For health purposes, you can enjoy the same forms of turmeric you use in cooking. Or, you may find it in supplements.